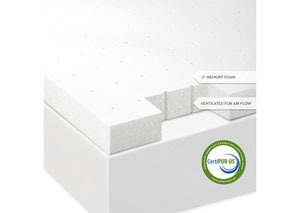 This mattress topper core is made with Dunlop latex. Dunlop is a more consistent, durable, and firmer latex that doesn't have the natural smell of other latex. Latex's springy nature will more quickly respond and mold to your pressure. As it cradles and gives support to your natural pressure points, you will have an individualized comfort level to match your needs. Latex is resilient, so it will quickly recover loft and won't leave long-lasting body impressions. Sleeping on latex means you are sleeping on top of the foam, for an airy, cloud-like feeling. This ISOLUS® Latex topper core is made in the USA with thorough quality control systems in place. Each topper is made with no fillers, no glue seams and no laminations. The pure material is produced with a consistent latex foam that is poured, vulcanized to remove impurities, and then washed and dried to finalize the latex curing process. The end result is a soft, comfortable foam mattress topper that does not wear and break down like other foam sleep products do. 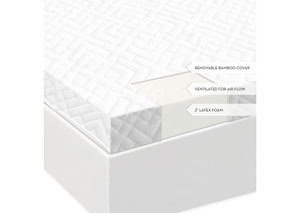 This allows you to have a consistent sleep experience over the entire life of your mattress topper. Protecting this topper is a super soft bamboo cover. The cover is hypoallergenic and mildew proof, and bamboo's natural pores make the material breathable for a cooler sleeping temperature. The cover is removable for laundering, allowing you to create a healthy sleeping environment. We offer a 3-year warranty that protects the mattress topper and cover against manufacturer's defects.